Grandma P and I just got home ten days ago from a 60 day cruise that went around the Pacific Rim. It was a marvelous, bucket-list cruise that included Alaska, Japan, China, Taiwan, South Korea (North Korea was not conducting excursions that day, or any day! ), Viet Nam, the Philippines, Guam and Hawaii. Whew! There were to be 22 ports of call, but two were cancelled as we were dodging a typhoon on our way from Alaska to Japan. There are nothing like 40 foot waves to get your attention on a ship! Meanwhile, back in the good ole’ US of A, all kinds a ‘goings on’ were occurring. There were deadly fires taking place in California. Hurricane Michael, a very late in season hurricane, came ashore just east of Panama City, Florida. Were we concerned? Being the eye of that category 5 hurricane came ashore just 59 miles from our house, you could surmise that we were very concerned. We would have been more concerned if we were not dodging a typhoon at the same time creating the 40′ waves. Oh. There was one more event that took place during our cruise. We had the midterm elections. Was there any drama surrounding that event? We were not sure who the governor or US senator from Florida would be until almost two weeks after election night. We got off the ship on November 18, and I believe Ron Desantis and Rick Scott were declared the winners the day before. (If those damn Russians would quit meddling in our elections, we would have had the results sooner!) Anyway, after a run-off in Mississippi for senator, and a bucket load of close elections around the country, the end result is that the Republicans picked up two seats in the Senate, and lost about 30 seats in the House of Representatives, giving the Democrats the majority. So now, dear readers, I have finally gotten to the meat of this blog. Will our new Congress legislate, or investigate? I have some suggestions for our Congress if they feel like performing their jobs and decide to legislate. Firstly, that caravan of immigrants, that caravan that the media tried to convince us was imaginary, has now appeared at our borders. Recently, things turned ugly when bottles and rocks were thrown at our border security people. Not only that, it is confirmed that there are more caravans on the way. We have all heard different stories as to the composition of these caravans. The most reliable information for me comes from the Mexican government. I am skeptical of our media coverage, so the Mexican government has no reason to sugarcoat the caravan composition. They are reporting that 75% are working age males. The remaining 25% is divided between women and children. Less than 5% of these people have a tinge of a case for political asylum. The Mexican government has offered jobs. But yet, they decline and keep coming. The Mexican government has offered ‘political asylum.’ But yet, they decline and keep coming. The Mexican government in conjunction with our border security people cite that a full 10% of these people have criminal records. Do you want these people as your neighbors? If these people are really trying to escape bad countries in the hope of entering our country, why are they carrying the flags of the country they left and not the flag of our country. To me, this indicates they do not really want to assimilate and contribute to our society as Americans, but abuse our benevolence as immigrants. If that sounds like a boring prospect, how about addressing the problem of Russian aggression in the Ukraine and the military build-ups by both Russia and China. Still boring? Well, then throw in North Korea and Iran to boot. That should keep Congress busy for a while. Our past politicians have failed to address these issues for years and now this has festered into a bigger, global problem. Here is a thought. How about establishing voting requirements for elections. You know. Simple stuff like being a US citizen to vote in our election. How about a photo ID to vote? I know this would inconvenience the average US citizen about 10 minutes to prove they are actually a US citizen, but I believe that the inconvenience is well worth it. It gores my bull when I think that my vote could be cancelled by someone not remotely eligible to vote in this country. And with that in mind, Robert Mueller is still, after two years, trying to determine how the Russians influenced the 2016 election. Let me help you with that Robert. They didn’t. After $40 million, you still cannot pinpoint Russian influence on that election. Yet, I am sure that many non-citizens voted in our election. The Russians could only dream of affecting our elections as much as states allowing illegals to vote. Have you heard one item that the Democrats plan for legislation after they control the House of Representatives? One item? Anyone? Naw….me neither. What I have heard is that they plan to ‘investigate.’ What do they plan to investigate? Well, they are foaming at the mouth about being able to investigate Donald Trump’s tax returns for the period when his father passed the corporation from himself to Donald. Considering Fred Trump died in 1999 at the age of 93, and retired from business in the 70’s, that would be one helluva IRS investigation. How many corporations or individuals keep records for almost 50 years! But wait! This investigation would make great ‘political reality TV,’ and maybe, just maybe we could create enough skepticism to get Trump impeached! Believe it or not, I am OK with the IRS doing an audit on Donald Trump. Because America is the land of opportunity and fairness, I would want an IRS audit done on each and every member of Congress! I would want to know how a person gets elected to Congress as a pauper and walks away as a ‘gabillionaire.’ Wouldn’t you want to know? How is it that Barack Obama is elected POTUS with a net worth less than mine and now has a net worth of $135 million. (Yes. That net worth is more than mine. But I wrote this blog and what did he do?) Don’t you want to know? After watching the Kavanaugh hearings (And the new Murphy Brown show! But, more on that later. 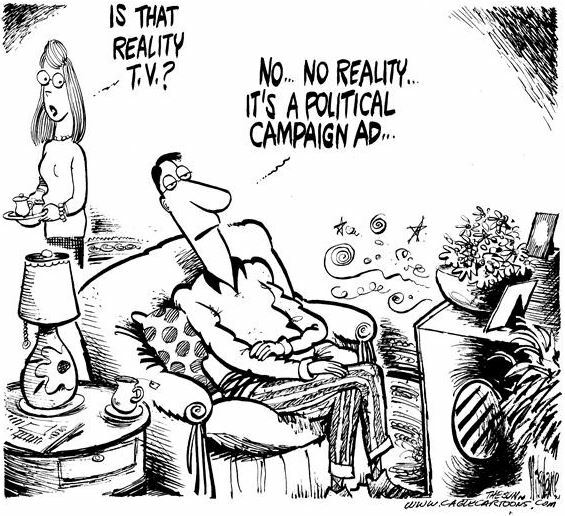 ), I hope that ‘political reality TV’ is not the new norm. If it is, heaven needs to help us through the next two years. A lesson learned from all of this? Grandma P and I cannot leave the country for extended periods of time. It goes to hell in our absence and political programming like Murphy Brown appears on TV, attempting to pass itself off as a comedy. You failed, and you have been canceled. Thankfully, good judgement prevailed in that decision. I am beginning to think that I, too, may be a ‘dreamer.’ I dream that maybe one day, our Congress will legislate, and eventually do what is right for America. Legislate, not investigate. GET TO WORK! This entry was posted in Common Sense, Common Sense Solutions, Political Insight, Political Opinion, Politics and tagged 2018 midterm election, biased media, Bill Clinton, border security, Clinton Foundation, congress, Donald Trump, federal voting requirements, Hillary Clinton, illegal immigration voting, immigrant caravans, Iran and North Korea, IRS audits, legislate or investigate, Media Bias, Murphy Brown, Russia and China military aggression, Voter ID, voter requirements on December 1, 2018 by Grandpa T.